While I was in Niagara Falls this past weekend, I had the amazing opportunity to see an aerial view of the Falls via Rainbow Air Helicopter Tours! This was my first time in a helicopter, and I was able to cross something off of my bucket list. 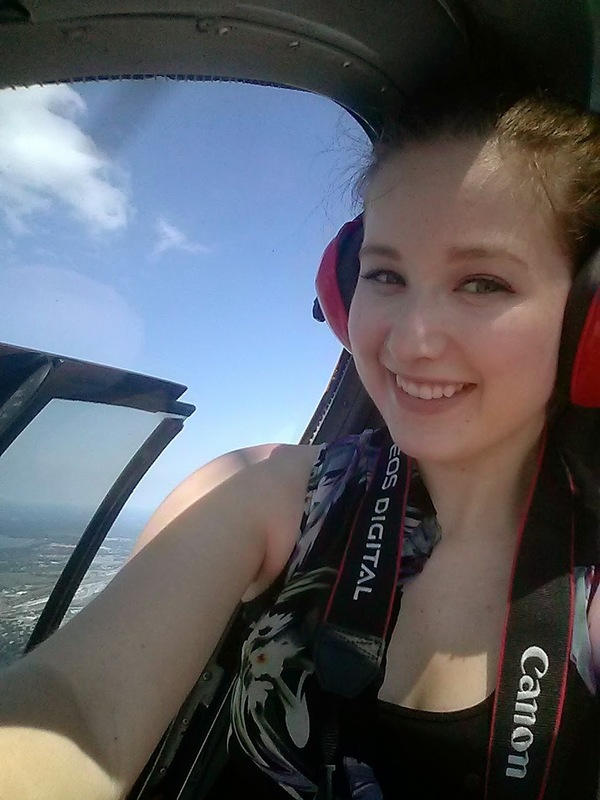 Taking a helicopter tour might sound like an extravagance (and it kind of is), but I'm telling you that it's worth it! Cost: $105 per adult, minimum of 2 passengers per flight. 10-12 minutes in duration. Longer flights are available. The standard tour offered by Rainbow Air is a 10 minute ride over the Falls. I was given these big red earphones, since it is quite noisy in the helicopter. The staff helped me into the helicopter and buckled me in. There are two passenger seats in the front and two in the back of the helicopter, along with the pilot’s seat in the front. I was really glad that I got to sit in the front – the view was just amazing! There are little windows on the doors that can slide open, just don’t stick your arms or camera outside (duh!). We flew over the Falls, so you get an amazing bird’s eye view of this incredible attraction. It's super easy to capture some amazing photos, so be sure to bring your camera. Afterwards, the staff was willing to take photos of the passengers with the helicopter, which I thought was really nice! I’m not scared of heights, so I was really able to fully enjoy this experience. If you do have a fear of heights and/or flying, I’m sure that the staff would be able to make you feel safe. The staff was very fun, friendly, and helpful. Seriously, if you’re visiting Niagara Falls, this is such a fun and exciting activity. I also think that this would be perfect for couples – a trip over the Falls sounds incredibly romantic to me! In fact, Rainbow Air even offers wedding services in their helicopters! Can you imagine getting married in a helicopter? How exciting! Rainbow Air also offers extended flights and charter services. Me with the pilot and Michelle, the coordinator of my amazing Niagara Falls trip! If you can fit a flight into your budget, I highly recommend doing so! Rainbow Air is located at 454 Main Street, which is just a short walk from the Falls, and beside the entrance to the Rainbow Bridge. Call 716-284-2800 for reservations. Have you ever taken a helicopter ride? Thanks Rainbow Air for the complimentary flight! I've never been brave enough to go in a helicopter (the downside of working in insurance!) but I'd love to. I'm toying with a trip in one when I go to Vegas this year. Finally,niagarafalls@zoomtours let us know that the fall is a fantastic time to visit Niagara Falls - the landscape and leaf changes make it an unforgettable experience.